SPAM Jam has returned to satisfy your SPAM cravings. Located at the 2nd floor of SM Megamall A, this kiosk lets you enjoy your favorite canned meat in three ways –the Spam burger, Spam rice meal, and Spam Musubi. 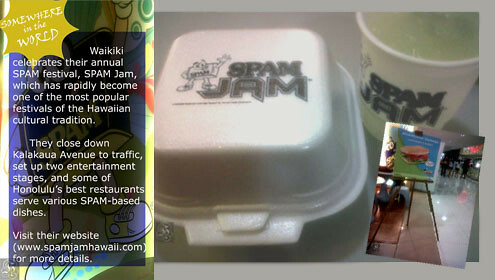 A few years back, SPAM Jam opened its first branch in Glorietta but it eventually closed down. This luncheon meat produced by the Minnesota-based Hormel Food Corporation started as a popular balikbayan pasalubong and is now readily available in most grocery stores around the country. Spam comes in a variety of flavors some of which are cheese, hickory smoked and bacon but Spam Jam only offers the classic recipe. The SPAM rice meal, which includes two thick Spam slices, one sunny-side-up egg and a cup of rice, will not only slake your craving but will drive your hunger away. The SPAM burger is a delicious and heavy snack option which is made up of two generous grilled Spam slices, bread, lettuce, tomatoes and ranch dressing. 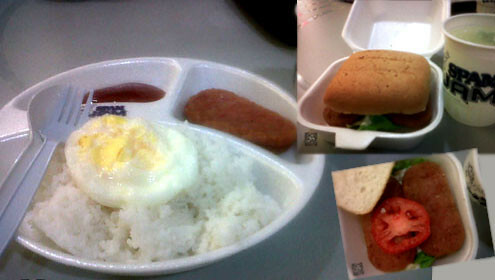 These meals are affordable at P77 and you can add P8 for a cup of lemonade or iced tea. Originally a crowd favorite in Hawaii, SPAM Musubi –a slice of SPAM on top of a block of rice bound together with Nori also known as a dried seaweed sheet, has reached the Philippines shores. It is affordable at P45. *For questions or suggestions, you can email me at [email protected], tweet me @hannahdormido, or access the original article posted at P3 and leave your questions/suggestions at the comments section.